Published by Mantra Books, Jenny's new book is a spiritual workbook on becoming the 26 spiritual qualities, as detailed in chapter 16 of the Bhagavad Gita. Launched Jan 2019 on Amazon 11.99 paperback /£7.19 ebook, or as a signed copy directly from Jenny £11 plus P&P. 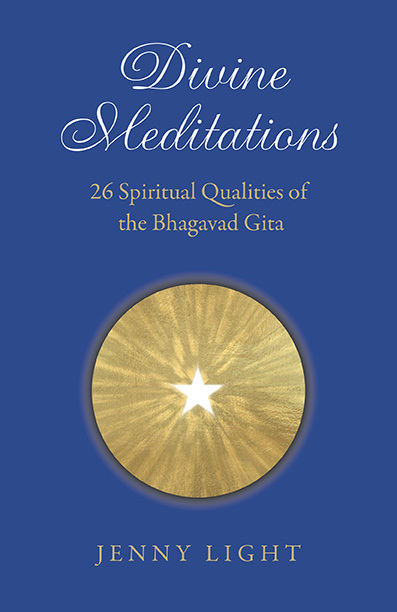 Jenny Light discusses developing soul qualities from her book 'Divine Meditations: 26 Spiritual Qualities of the Bhagavad Gita' (Mantra Books January 2019). Want to make your whole life a meditation? Read this book. There is considerable beauty here, and a great gift in these sacred chapters. Spirituality springs eternal in these leaves. Jenny Light’s luminescence beams through every room in the mansion of high spirituality—from the high theory of it through coaching your personal breathing. Everything you need to know shines here, within this book—and within yourself, as you will pleasantly discover. Jam-packed with spot-on, solid spiritual wisdom, shared openly and eagerly by an enlightened Jenny Light, spirituality springs eternal from these pages. This is a fine book—so good it should anchor the spiritual wing of your personal library. It’s a book to savour, to read again and again until you get it. And when you do, you will, like Jenny Light, find yourself enlightened. Seriously and joyously. Author Interview for 'Living Lightly: a journey through Chronic Fatigue Syndrome (M.E.)'. Jenny Light shares insights & answers how she came up with the combination of affirmation, diet, breathing, meditation and spiritual healing in her book. Jenny is currently working on her 3rd book: Taking Yoga Beyond the Mat. Due out 2021. Sign up with your email address to receive notification when Jenny's new book is out in print, book events & updates.